�Tussilago Petasites. �Some Herbals denominate this herb Colt's Foot. But it is a very different plant. It springs up in February, with a thick stalk a foot high. The flowers appear before the leaves. 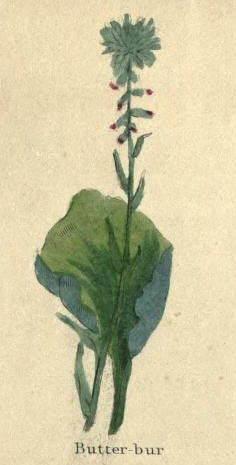 The stalks are round thick and spongy, of a whitish colour, and have a few imperfect leaves upon them. On the top of each is a spike of flowers, of a pale reddish colour, and before it has been a month above ground, it withers, and the leaves begin to spring, which being full grown, are very large and broad, being rather thin and al�most round, whose thick red sour-stalks above a foot long, stand towards the middle of the leaves; the lower part being divided into two round parts, close almost one to another, and are of a pale green colour, and hairy underneath. They grow in low and wet grounds by rivers and water-sides; their flowers rising and decaying in February and March, before the leaves which appear in April. It is a great strengthener of the heart, and cheerer of the vital spirits. The roots are, by long experience, found to be very good against pestilential fevers, by provoking sweat, to be taken in wine. The decoction of the root in wine, is good for those that wheeze much, or are short winded. It provokes urine and is good for gravel, and kills flat and broad worms. The powder of the root is a remedy for sores hard to be cured, and it takes away spots and blemishes of the skin.